The new Penny+Giles model UCM is a low voltage dc powered Universal Conditioning Module designed to operate with a wide range of LVDTs, RVDTs and other analogue inductive transducer types. The set-up is simple and flexible, allowing user adjustment of excitation voltage and frequency, operating mode, span output and zero position, as well as configuration for multiple unit synchronisation. The UCM has a rugged die-cast aluminium alloy housing that is dust and fluid protected to IP68. 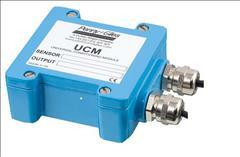 The UCM provides a simple 0.5 to 4.5Vdc analogue output signal. By using additional plug-in module cards, a variety of different voltage ranges, a current output, or a digital PWM output can be obtained. The module operates from an unregulated 10-30 Vdc supply.